A hinge joint, also known by the scientific name of ginglymus, is a joint in the bones of an animal or person that allows bone movement in only one direction. Following are some examples of hinge joints throughout the body. The elbow joint is a joint in the human body. This connects the upper portion of the arm, which is called the humerus, to the ulna, or the lower part. Thus, it is called the humeroulna joint in the medical community. The humeroulnar joint is placed in between the trochlear notch of ulna and the trochlea of the humerus. Interfalangeal joints are simply the joints that connect the fingers together in the human body. The proximal interfalangeal joints are the joints that are located in between the first and second phalanges, or finger bones. This joint has great lateral stability. The distal interfalangeral joints are the hinge joints between the second and third phalanges, or finger bones. Both sets of interfalangeal joints on the fingers exhibit only two movements - flexion (moving your hand into a fist) and extension (stretching out your fingers). Interphalangeal joints are the joints in your other set of phalanges - your toes. These joints are also hinge joints, each of which has an underside known as a "plantar," and two collateral ligaments. While your toes certainly look different from your fingers, they in fact work in much the same way, and exhibit the same two movements, flexion and extension. 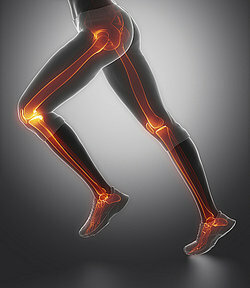 The knee joint attaches the thigh of a person to the lower leg. Because it is the largest joint in the human body, it is a relatively complicated joint to understand in terms of connection and motion. It is different from other hinge joints, except for the ankle, because it allows for some slight side-to-side movement rather than simply flexion and extension. Your ankle joint is another hinge joint example. Known as the talocrural region, this joint is responsible for the motion of your foot at the ankle. Like the knee joint, this hinge joint is rather unique in that it allows for some side to side movement. In fact, the hinge joint of the ankle comprises three separate joints: the talocrural joint, which takes care of the front to back motion, and the subtalar joint in addition to the inferior tibofibular joint. The subtalar joint allows for the inversion and eversion of the foot. Inversion is the movement toward the inside of the leg, which allows you to rest on the outside edge of the foot. Eversion is the opposite - it lets you rest your foot on the inside edge, where the big toe is located. The distal tibofibular joint allows limited movement of the foot. It works with the movements at the ankle joint. The jawbone is another complicated hinge joint. Although it is a hinge joint primarily - allowing you to open and close your mouth - is exhibits some movement side to side. Like the knee and ankle joint, it can also exhibit a certain amount of rotary movement which is characteristic of a number of other types of joints such as the ball-and-socket joints). Now you have a list of examples of hinge joints found throughout the body. "Hinge Joint Examples." YourDictionary, n.d. Web. 23 April 2019. <https://examples.yourdictionary.com/hinge-joint-examples.html>.